Despite what some may think, the tedious nature of knitting and spinning really aren’t only for people with an extremely meticulous and focused nature. I honestly think it’s quite the contrary. At least such is the case for me. 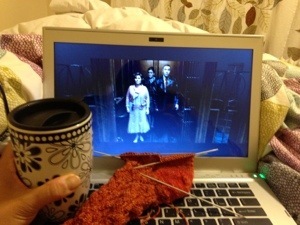 Knitting allows me to float around somewhat aimlessly while remaining productive. That might seem like an oxymoron, but indeed I can do a little of this and that, here and there, yet still feel as if I’m not wasting my life away. That being said, I started cleaning this past weekend. And found…a ridiculous amount of WIPs. Too many to even begin to count. (This may not be a ton for you, but it’s a ton considering I a) just moved; b) just pared down my yarn stash to half due to that move; c) just started having a regular source of income for yarn) Nevertheless, I’ve come to a decision: no more fibrous purchases and starting any new projects (except “drinking” projects) until I finish all my current WIPs or Lent is over. Now the meaning behind this decision is multi-faceted and can be interpreted in any way chosen; however I will not be spelling those out. Let’s see what the progress is at the end of these six weeks. So far, I’ve finished half of the pair of striped socks…yay? Truly there is nothing better than a beloved movie (Harry Potter Series for me), some knitting, and peppermint chamomile tea to cap off a long week.